Beastlords are the 25th class to be introduced to EverQuest II. Their release date is December 6, 2011. The class can only be created if the Age of Discovery expansion has been purchased on your account. Beastlords are neutral and cannot change to a different class when betraying. Unlike the other 24 classes there is no "counter-class" to Beastlords. This is a Scout class, meaning that it can equip chain armor. When it comes to weapons, Beastlords favor Brawler styled melee and ranged weapons. They cannot use bows or swords but like other Scouts they can use piercing weapons. Their primary stats are agility and stamina. Unlike other Scouts, this class has a pet, called a warder, that it relies upon and is most effective with. The Beastlord can collect and use a wide variety of warders. Also unlike other Scouts, Beastlords do not get Disarm Trap. These trainers sell the three Beastlord fluff abilities plus a buff ability called Singular Focus that prevents auto-attacks from striking multiple targets. They can also give some generic class advice if asked. inside the treehouse up Arbos, the Elddar Tree in Elddar Grove. Beastlords receive three "fluff" abilities at level 20, 40 and 50. 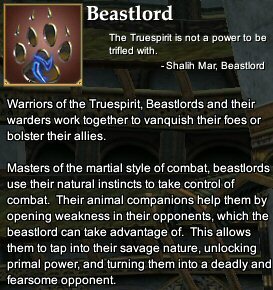 These abilities are simply for visual appearances and can be purchased at a Beastlord Trainer. The level 50 fluff ability can only be used on a summoned warder. Click on any image below to enlarge it. Please note that Visage of the Truespirit simply applies the ghostly effect to whichever warder is out at the time; we happened to be using a cow warder in our example. Beastlord pets are called Warders. The warders are broken up into 16 families: 12 normal and 4 exotic. Each race starts with one of the warder families. At level 10 the Beastlord gains the ability Tame Warder which can be used to add a new warder to their arsenal. Tame Warder can be used once a mob that is tameable is knocked down to at least 50% health (25% health for exotics). The Beastlord must not have a warder summoned to be able to use Tame Warder. The first AA in the Animist tree, Beastlord Sight, can aid the Beastlord in finding warders that can be tamed. The Tame Warder ability does have a long cast time and can be interrupted, but the Stare Down ability, which briefly stuns the mob, can be used while casting Tame Warder. Using Cheap Shot before using Tame Warder may also help. Once the warder is tamed it will become the Beastlord's active pet. If the Beastlord did not already have a summon ability for the family that their new warder belongs to they will be granted that ability. The appearance of the Warders can be changed depending on what was tamed. For example, both cows and deer are part of the Bovid family. If the Beastlord first tames a deer, they would have a deer appearance warder. Later on the Beastlord can replace their Bovid's appearance by going and taming that cow they found. The level of the warder will increase with the Beastlord. The spell rank of each warder summoning ability will increase over time as the Beastlord uses Primal Tactics while fighting with a warder from that particular family (this is called Pet Affinity). On beta the warder summoning abilities started at Journeyman rank for the default. Upgrades to the warder summoning abilities cannot be researched or crafted. When your warder increases in rank you will get a status text notification informing you that "your affinity with your pet has increased!". These summoning ability spell rank upgrades are believed to not begin until the Beastlord and their warder reach level 30. Exotic Warders cannot be tamed until at least level 80. They require at least 80 Alternate Advancement (AA) points to be spent in the Beastlord tree, 10 of which must be delegated to the Sentinel's Fate AAs at the bottom of the tree. The endline Sentinel's Fate AA is Tame Exotic Warder. As of the end of beta, the Stare Down ability could not be used on exotic creatures and the health of the creature needs to be at 25% before you can use Tame Exotic Warder on it. Feldon of EQ2 Wire has published a fantastic guide with images of the many different warder appearances. Check it out here! Your warder will gain Alternate Advancement points (AA) over time. This is dubbed as Warder Specialization. Each warder family has its own AA tree. The AA is gained at the rate of one AA every two levels between level 22 through 90. These AAs are independent of the Beastlord's own pool. To access the warder AA trees scroll all the way to the right in the Alternate Advancement UI window. A drop-down menu will allow you to switch between families. The AA choices allow you to modify the skills of your warder. If you are unsure of which skills your warder uses you can look at their character sheet on in the Warders tab of the Character/Persona UI Window. We also have warder ability names listed on our individual warder family pages. At level 18 the Beastlord will first see their new Beastlord UI window. This UI piece has a gauge for Savagery gain and allows the Beastlord to assign Advantages and Primal Tactics. The savagery window gauges current savagery gain or loss. Savagery is gained on combat as the Beastlord uses Advantages. It decays as the Beastlord is out of combat but does not decay if you remain in combat. The more filled this gauge is, the more potent your Primal Tactics will be. Certain AA abilities can slow down the rate of decay of the Beastlord's savagery. Multiple levels of savagery gain can be stored up if the Beastlord is in combat long enough. The maximum level of savagery gain allowed is 500%. There is a Shadows AA (Savage Soul in the Beastlord endline) that will allow you to increase this amount to 600%. Once the Beastlord reaches level 18, occasionally during combat a flashing blue paw will pop up, denoting that the Warder has found a Weakness in an opponent. When this weakness opportunity is open the Beastlord can use an Advantage. Advantages that are available depend on if the Beastlord is in Feral Stance (offensive) or Spiritual Stance (defensive). To switch which Advantage is being used, right-click on the Advantages side of the Beastlord hotbar (left side) and choose one from the pop-up menu. More advantages become available as the Beastlord levels up. Only four Advantages can be on the hotbar at a time. At level 20 the Beastlord will receive their first Primal Tactic. This allows them to focus their savagery into a potent buff or attack. The more savagery the Beastlord has to more powerful their Primal Tactic will be. The savagery gauge must reach a certain amount for a tactic to be used. Primal Tactics that are available depend on if the Beastlord is in Feral Stance (offensive) or Spiritual Stance (defensive). To switch which Primal Tactic is being used, right-click on the Primal Tactics side of the Beastlord hotbar (right side) and choose one from the pop-up menu. More tactics become available as the Beastlord levels up. Only four Primal Tactics can be on the hotbar at a time. Advantages - Hotkeyed on the left-hand side of the Beastlord hotbar, these can be used while a Weakness has been spotted. Savagery - As Advantages are used the Savagery gauge will fill up. Primal Tactics - Once the Savagery gauge is at least filled up to 50% a Primal Tactic can be used (right-hand side of the Beastlord hotbar). The more filled the gauge is, the more potent the resulting tactic will be. Some Beastlord-specific lore quests are available. These are NOT the epic quests! The Beastlord Prelude quests have lore dialogue attached to their walkthrough pages. Some Beastlord lore was posted on October 19, 2011 on the EverQuest II web site. A Beastlord Q & A article was published on EverQuest2.com on November 9, 2011. ZAM would like to thank Whilhelmina for much of the information in this article which is from her Beastlord beta FAQ. ZAM would like to thank the many members of Heroes of Test (beta) for some of the information in this article. This page last modified 2014-03-28 15:58:00.